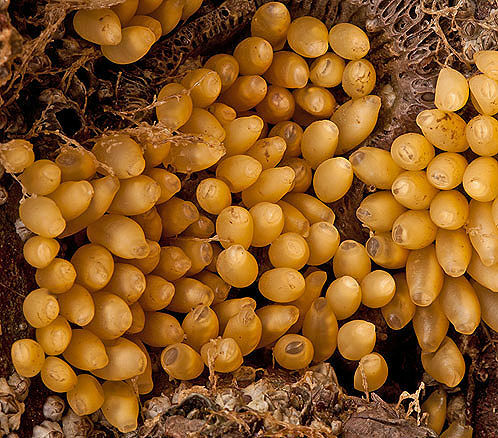 Egg Capsules of the Dog Welk - "Nucella Lapillus"
Hundreds of eggs are laid in capsules although only 6% are fertile. The mini-adults first meal is the unfertile eggs in their capsule. The young migrate to the lower shore to feed, moving up as they mature. Dogwhelks are carnivores, eating barnacles, limpets and mussels. The radula modified for shell boring is assisted by chemical means. The groove in the shell lip allows water in for breathing as this boring takes many hours: e.g. 48 hours for a barnacle.